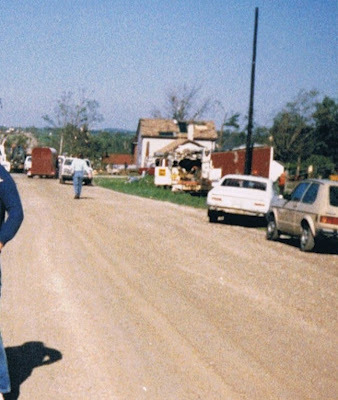 It was twenty three years ago today that a deadly series of tornados hit Ontario and the north-east United States. Grand Valley, Ont. 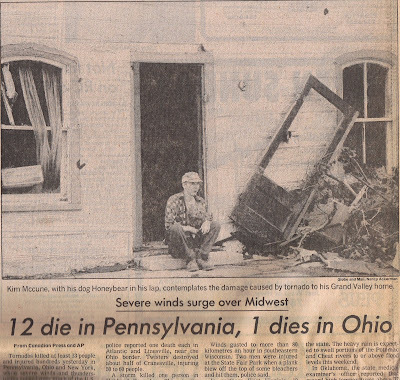 was suddenly hit at about 4:40 in the afternoon of May 31, 1985, causing death, injury, and severe damage in the village. These are some of my memories of that event. 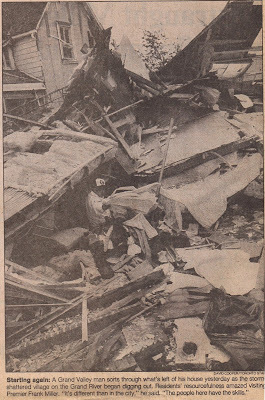 Below: Globe and Mail photo from Jun.1, 1985, showing the devastation of Cashway Lumber centre at the Mono Mall north of Orangeville. 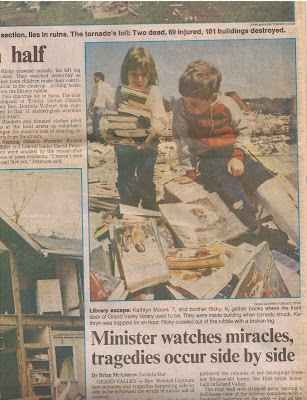 Above: Stories and photos, from the Globe and Mail, Jun.1, 1985. 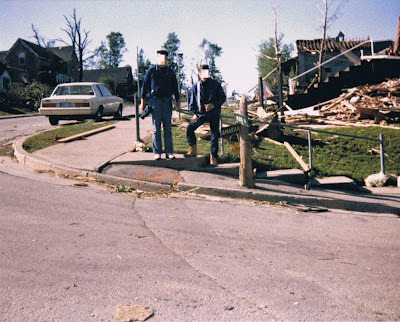 Below: Along Amaranth St. in Grand Valley, Ontario, taken Jun.2, 1985 by R. Bobak after the tornado. The damage is seen everywhere. Below: Amaranth St. (west of Main St.) looking east down towards Main St. Two photos below -first is the view now, second is the view as it was after the tornado. Below: An OPP officer directs traffic on corner of Amaranth St. and Main St., Jun.2, 1985. 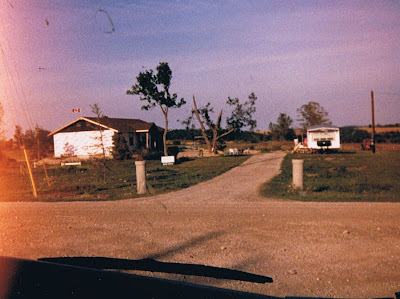 Note the snapped hydro pole on the corner had the street signs nailed on temporarily; and the hydro post and lines lying in the street. 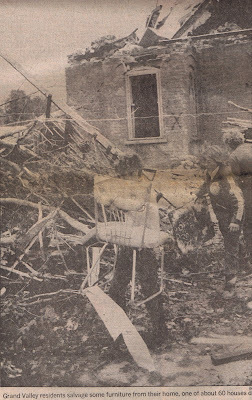 The old United church (seen in the right upper rear of photo) sustained so much damage, it was later demolished. Above: Looking south-west from Sideroad 5, standing just east of Townline Rd. (hydro poles seen being repaired on right are on Townline at Amaranth St.) over farm field strewn with debris. Jun.2, 1985. 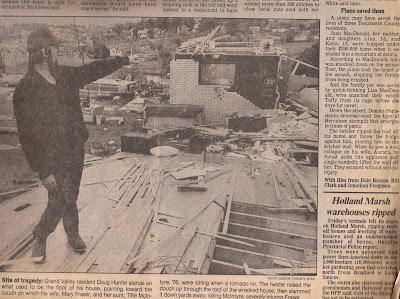 The house was severely damaged, while the barn was destroyed. 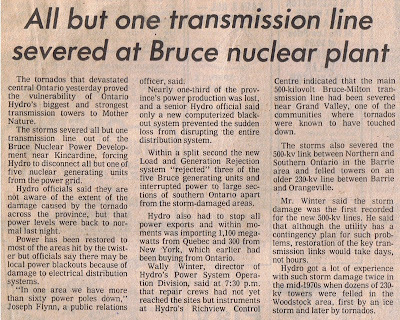 Below: the Globe and Mail front page, June 1, 1985. 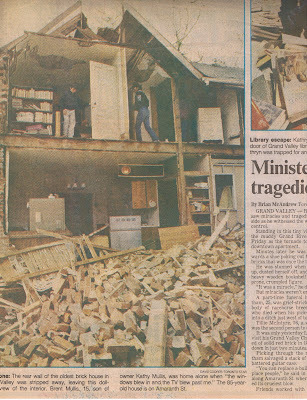 Below: the Sunday Star, June 2, 1985, front page; further down closer view of photo. Above: a view of Amaranth St. looking southward. The three houses at the top right are also seen in my photographs further down. There were papers and books everywhere. Ironically, I had even seen Frank L. Baum's book, The Wizard Of Oz laying in the street not far from the library. 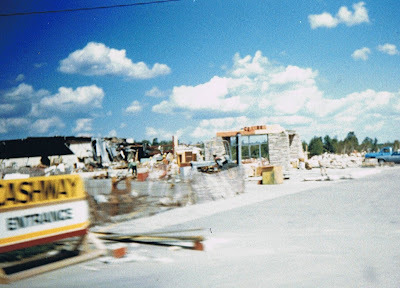 Above: the Cashway Lumber centre in Orangeville after the tornado, about the only thing left standing were the front door pillars. Photo taken by R. Bobak. Below: the Grand Valley Church of Christ on Amaranth St., as seen May 19, 2008. Above: same view, Jun.2, 1985, by R. Bobak. 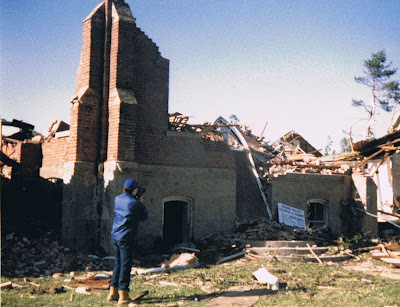 The beautiful old church was destroyed by the tornado. Below: The new church, looking towards the house to its east, May 19, 2008. 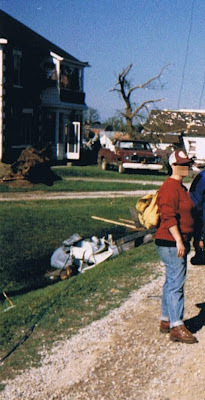 Above: same view (looking east at the same house next to the church), as it looked after the tornado. Jun.2, 1985, R. Bobak. Below: The second house to the east of the church. The corner of the first house (pictured above) is seen on the left side of photo below. (In the above photo, the second house's gable can be seen by the stripped tree.) A car lies buried in the rubble. Taken by R. Bobak, Jun.2, 1985. 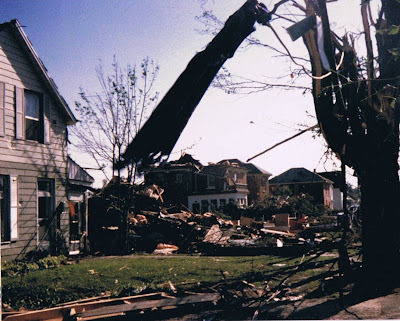 The first house was rebuilt, the second house was demolished. Below: Building on the corner of Amaranth and Main, kitty corner from the library, May 19, 2008. Above: same view, Jun.2, 1985. The tornado destroyed a brick library across the street, while this frame building remained relatively unscathed. Above: Same view, approx. summer-fall 85. Past the bridge and up the hill along the north side of Amaranth St. there were huge barn posts sticking out of the ground at an angle in the field. The tornado carried these pieces of lumber from somewhere and shot them into the ground like arrows. Below: Residence on Amaranth St., May 19, 2008. Above: the same view Jun.2, 1985, taken by R. Bobak. The debris from the tornado was everywhere - hanging from the tree was, of all things, someone's scarf. Below: a wider view, May 19, 2008. 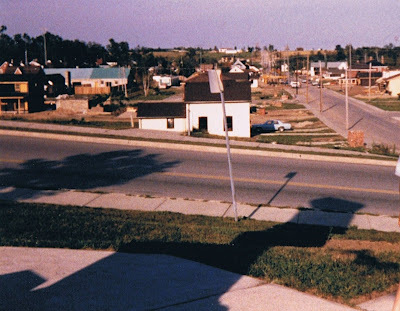 Above: same view, Jun.2, 1985, looking west along Amaranth St., towards three houses in the distance. 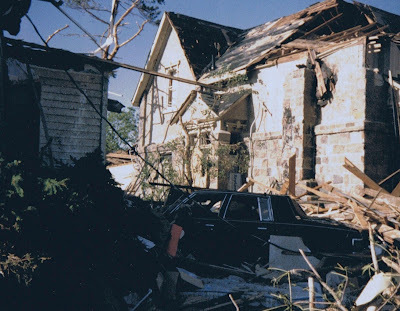 There had also been houses in between, which, as can be seen, were completely destroyed. 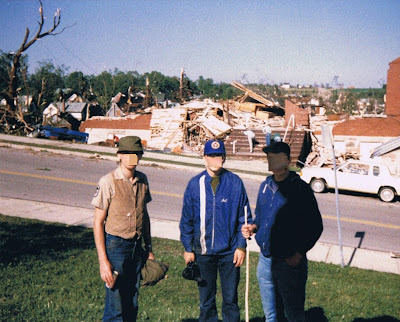 The trees had all kinds of tangled wires and insulation and clothing and aluminum siding wrapped around them. Trees had their leaves taken right off, or were pulled right out of the ground and carried away. Below: the three houses (seen damaged above) further west along Amaranth St., as seen on May 19, 2008. Below: two homes on Amaranth St., May 19, 2008. 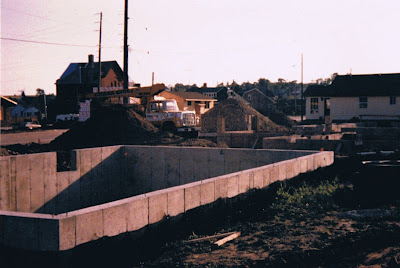 Above: same view of the two homes seen previouslyabove, when they were under construction, approx. 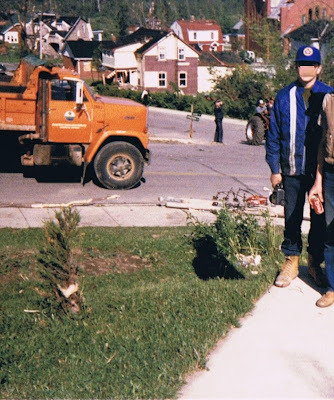 late summer/fall 1985, taken by R. Bobak. 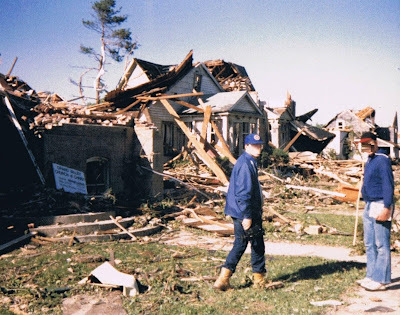 Note the United church's large roof gable with its chimney seen in the background; it survived the tornado, but was ultimately demolished. Below: View looking east across Main St. towards the Grand Valley Library, May 19, 2008. 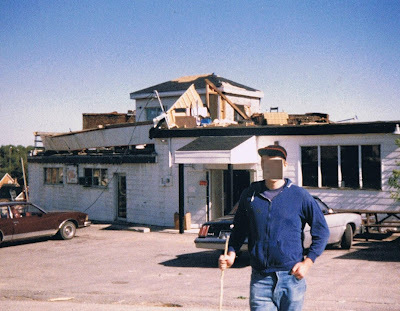 Above: same view, taken by R. Bobak about summer-fall 1985, as Grand Valley is rebuilding. 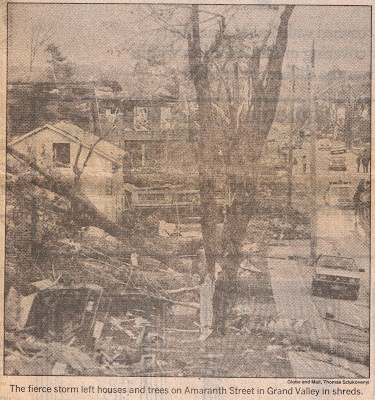 Note how bare Amaranth St. was; it had been such a beautiful, densely treed street before the tornado. Below: Looking north along Main St., across Amaranth St., towards the library, May 19, 2008. Above: same view, June 2, 1985. Note steps of the demolished library facing Main St., and the street signs temporarily placed on the hydro pole, which had been snapped off. In both photos above, the tip of the old school bell can be seen in the right far distance. Below: Looking across Main St. towards the new library, May 19, 2008. 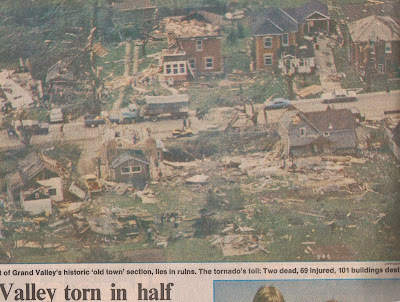 Above: same view, June 2, 1985. 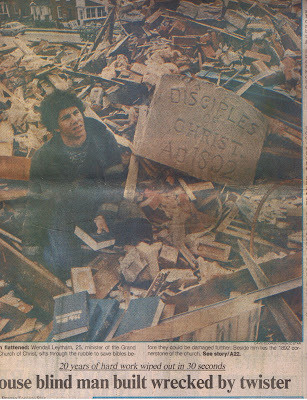 The library was destroyed by the tornado. A car lies in the corner. 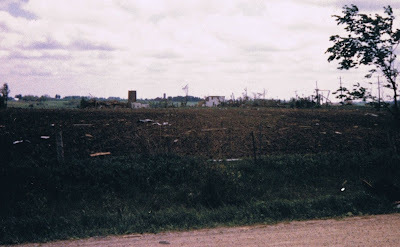 The trees which were still left with green leaves (seen along the left rear of photo) clearly show where the edge of the tornado's path was. 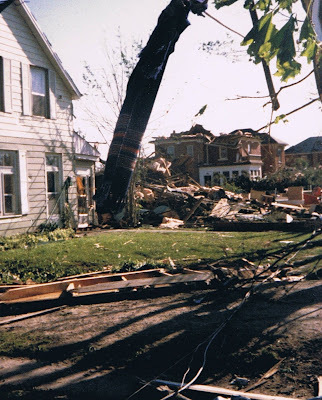 Looking in the distance at the right of the photo one could clearly see eastward straight down Amaranth St. to the hill on the other side of the Grand River - because the tree canopy was instantly destroyed along the tornado's path. As can be seen in the photo above, there are hardly any trees visible in the whole area behind the library's ruins. 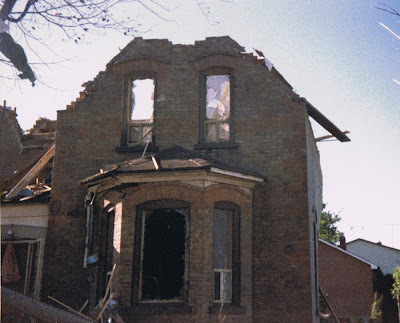 Below: Another Grand Valley brick home, showing what remained after it was hit by the tornado, as photographed by R. Bobak, June 2, 1985. 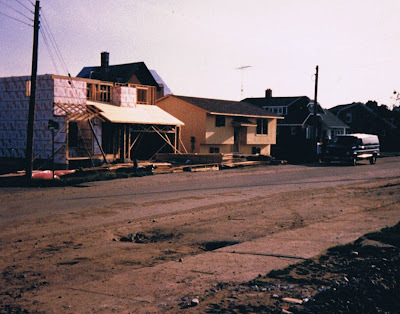 Not sure which street this home was on, or whether it was rebuilt, or demolished. (Can anyone provide details?) The devastation in Grand Valley was shocking.